A dinky handset that fails to offer a cutting edge performance. One for those concerned only with price and size. Motorola's original Defy was a winner of an Android smartphone for us, marrying solid build with a neat design and some nice software touches. It was followed by a revamped handset, the Motorola Defy+, which updated some of the features but left most of what was in the original mobile phone untouched. Now the Motorola Defy Mini has popped up, a smaller version of the Defy with some design changes, but the same solid specifications. This phone might be a steal, priced at around £160 (around $260) SIM-free in the UK, with the only real rival coming from Samsung's Galaxy Xcover. The Motorola Defy Mini is small. You might say this is a handset designed for a child's hands. And this is a good market for a rugged phone, given how kids are not known for their delicacy and TLC with their technology. Anyway, it measures a teensy 109 x 58.5 x 12.5 mm and it weighs just 107g. That inevitably means a small screen - just 3.2 inches with 480 x 320 pixels. The 600MHz processor raises a few on-paper concerns, and the rather short memory allocation of 512MB is another potential worry. There was 121MB free on our sample before we added any apps or data. The camera tops out at 3 megapixels - another budget handset marker, although there's a front camera too, which is nice. Meanwhile, looking over the remaining specifications it becomes clear that Motorola has included the standard smartphone essentials of Wi-Fi, Bluetooth, 7.2Mbps download HSDPA, GPS and eCompass. There's DLNA too. The Android operating system is old, at version 2.3. Ice Cream Sandwich is really where it's at for Android smartphones now. There's a rather impressive 1650mAh battery, which in theory ought to keep the phone going for a relatively long time. The rugged features are key to the Motorola Defy Mini's success. Gorilla Glass has been used for the screen so it is scratch resistant. The top mounted headset connector and left side mounted USB port are protected by hinged covers. The backplate is held tightly in place by a sliding lock, and there's a seal around the battery. 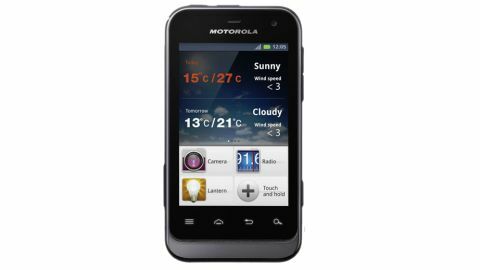 The design isn't as industrial looking as that of the Defy and Motorola Defy Mini, but we like it for that. The rubbery backplate is preferable, we think, to the shiny plastic of the Defy and Motorola Defy Mini, and we reckon it'll make the handset easier to grip outdoors when you're wearing gloves. We like the side-mounted camera shortcut button on the right edge, though it's small and fiddly to use, particularly when you are wearing gloves. Ditto the volume buttons on the same edge. And we aren't overly excited about the tiny on/off button on the top edge, which is also fiddly to use. Interestingly, we don't see the IP67 rating flashed around with the Motorola Defy Mini, although the phone is touted as dust and water resistant.